20111231 - Up and out to McD's for bfast. A stop at TUFFY to see why the car is overheating, then to get gas. Finally on the road through the rain to the Farm. 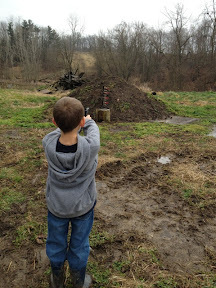 Got unloaded and then out to shoot the new gun and play at the barn. 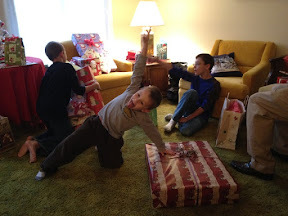 Then in for presents and the boys went crazy. The boys played and built their stuff. 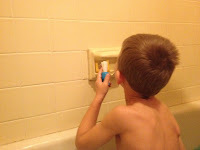 We had Chinese for dinner and more playing and shaving. 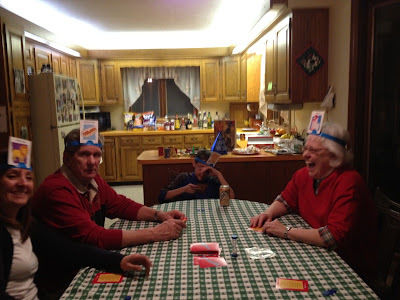 Then a funny game of Headbands. Before all boys to bed and then we stayed up and watched the ball drop.